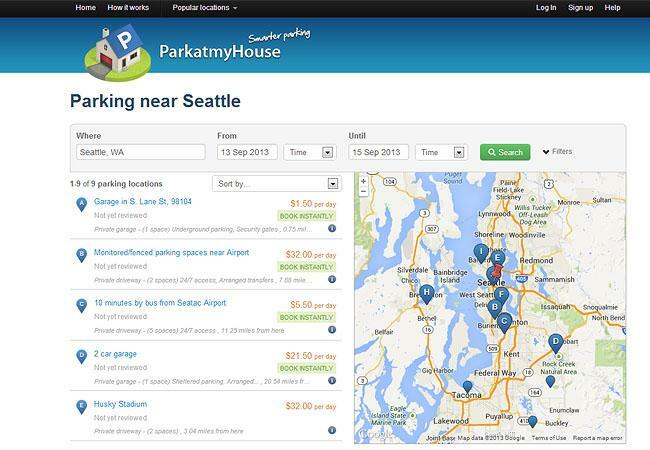 Websites like ParkatmyHouse.com let you rent out a parking spot in your driveway to others. First there was Craigslist. Then other more specialized websites arrived to make it easier to rent out your spare bedroom, vacation home, or even your car. A new category to catch on in the Northwest allows drivers to reserve a parking spot in someone else's driveway. The concept is pretty simple says Alex Stephany, London-based CEO of the website parkatmyhouse.com. "The idea is just if you have a parking space or driveway that is not being used some of the time, you can let someone else use it and you can make some money in the process." Stephany says his company did not specifically target the Pacific Northwest for expansion. Enterprising homeowners around the region found his website or one of its competitors on their own. "The most successful property owners on parkatmyhouse.com tend to be around sports stadia -- like say, Husky Stadium in Seattle - or around airports." Stephany says parking spot owners are responsible for figuring out if the transaction is allowed in their neighborhood. Some Northwest cities have legalized residential off-street parking rentals, but in others it's so new the rules are unclear.